What is Dampness and how can Acupuncture help? Damp is a term acupuncturists use when the fluids of the body aren’t being processed correctly, leading to a buildup that can settle in and make itself at home in almost any area of the body. This, in turn, can lead to a wide array of mental and physical issues. If dampness invades the entire physical body, it can cause weight gain, sluggishness and a lack of motivation. Think of how you feel on a foggy, rainy day. Now imagine that fogginess and sogginess being inside of you. You would feel heavy, bloated and slow. You would be more comfortable just sitting around, rather than engaging in movement. Your thoughts might be a bit confused, rather than clear and concise. This is what happens when there is an infestation of dampness. If the dampness attacks specific areas, it leads to heaviness and dullness in whatever part of the body it festers in. If it settles into the head, it can cause a dull headache that feels as if a band is squeezing the head. This type of headache generally tends to either be stimulated or worsened by damp weather. Dampness in the head can also cause sinus pain or a stuffy nose. From an emotional standpoint, dampness can muddle the thinking, making it hard to think clearly. In the extreme, it can lead to mental impairment. If dampness attacks the digestive system, it can cause vomiting of fluids, diarrhea or abdominal pain. With internal issues, damp usually transforms into damp-heat. Damp-heat of the intestines causes bloody, painful diarrhea. Damp-heat in the lower burner of the body can bring on sores, painful and burning urination or a host of other issues. If it is hot and oozy, think damp-heat. Pain caused by dampness is heavy, usually severe, and stays fixed in one place. Arthritis can fall into this category: the pain is concentrated in one place, the afflicted area is stiff and hard to move, and damp weather usually makes it feel worse. The true evil of dampness is that it is a self-propelling cycle. It weighs you down and resists change. That person who feels sluggish and weighed down could dissipate some of their dampness by moving, but the sluggishness makes the person want to sit still. That lack of movement creates more dampness…and so it continues. Fortunately, acupuncture and herbs are wonderful options for getting rid of this dampness. Nobody wants to be damp. When dampness occurs it is imperative that you solve the issue, the body should never be overly damp. Dampness is heavy, stagnant and tends to solve things down throughout the body. In addition to changing your diet and the way you eat, there are specific acupressure points that work to alleviate dampness. Here are three great points to try. Gall Bladder 14 – With dampness can come sinus pressure. 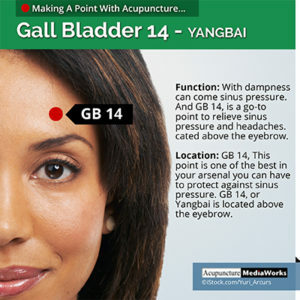 And GB 14, is a go-to point to relieve sinus pressure and headaches. This point is one of the best in your arsenal you can have to protect against sinus pressure. GB 14, or Yangbai is located above the eyebrow. 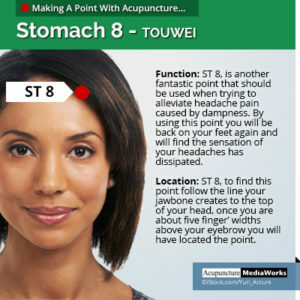 Stomach 8 – ST 8, is another fantastic point that should be used when trying to alleviate headache pain caused by dampness. By using this point you will be back on your feet again and will find the sensation of your headaches has dissipated. To find this point follow the line your jawbone creates to the top of your head, once you are about five finger’ widths above your eyebrow you will have located the point.